Can’t help but be drawn into this new novel. What a fascinating premise. While researching Ernest Hemingway’s personal papers, Erika Robuck discovered a photograph of the famous author on the dock in Havana, surrounded by poor fishermen and a young Cuban girl. The image of the intense young woman stayed with Robuck. 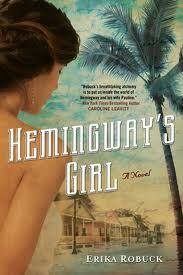 Later, she channeled that memory into Mariella Bennet, the independent and fearless protagonist of Hemingway’s Girl. Born of a Cuban mother and white father, this feisty young woman takes on the responsibility of supporting her widowed mother and sisters after the untimely death of her beloved father. When the novel opens, Mariella is scurrying between odd jobs and occasionally betting on boxing matches. After meeting Hemingway, she secures a position as maid at his house in Key West, where he lives with his second wife, Pauline, and their children.